Audience members can experience Derby Theatre’s production of TWO like no other show at the Theatre before, by booking exclusive on-stage Experience Seats. 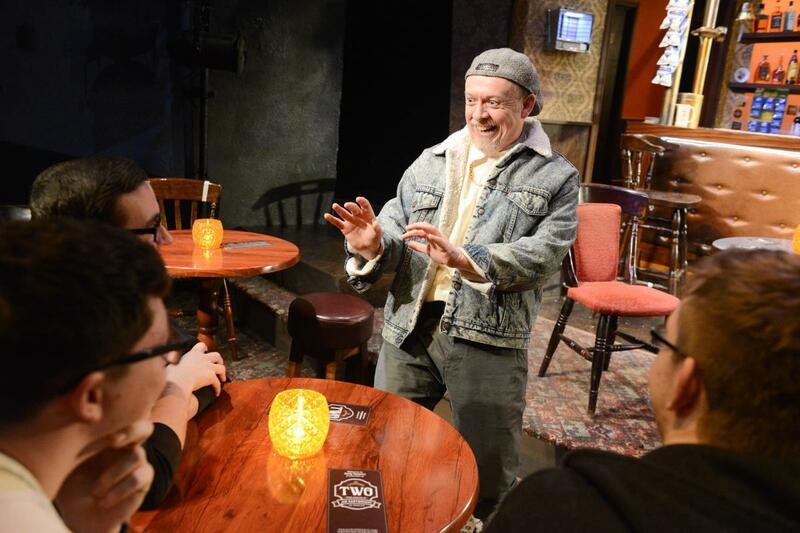 This is a unique chance to be immersed in the production and get up close and personal to the actors and the wonderfully authentic stage set, designed in great detail to replicate a traditional pub. These exclusive seats will also include a drink from the on-stage working bar before the show and on Friday and Saturday performances, there is an extra special opportunity to enjoy a pre-theatre meal and a drink in the cosy surroundings of the Theatre’s ‘local’ on the main stage. There are just 24 Experience Seats available per performance, so early booking is strongly recommended. "The best production of TWO I have ever seen... book a stage seat to enhance your enjoyment of the evening to the maximum"
Booking for Experience Seats is only available through Box Office - please call 01332 593939. Please note that Experience Seats are not available to purchase with a season ticket. One drink - included in the price- will be provided before the show. The on-stage bar will then open for 20 minutes during the interval. All full range of drinks are also available for purchase from the Upper Foyer Bar (open from one hour prior to the performance). The set for Jim Cartwright's 'Two' @DerbyTheatre - and yes, those *are* audience members in the thick of the action!